PHUKET: Officials on Friday (Feb 23) arrested a Patong seafood restaurant manager who has been selling overpriced shrimp dishes to Chinese tourists. The arrest of Kanyanat Chookaew, 26, was announced by officials at a press conference held at 2pm yesterday (Feb 25) at the Phuket Tourist Police Station and attended by Tourist Police commander Col Tongchai Wilaiprom, Director of the Control and Development Economic Trade Division Phuket office Yaowapa Pongkaeha, and Senior Officer of the Phuket office of Commerce and Weights and Measures Jamrat Kleangkaew. Col Tongchai said, “The arrest of Kanyanat came after we received a complaint from a Chinese website that has been warning Chinese tourists to be careful of an overprice restaurant in Phuket. The website stated that on Tuesday (Feb 20) they received a complaint from social media users where it was said that during Chinese New Year Chinese tourists have been cheated from a seafood restaurant in Phuket. “The restaurant’s menu said shrimp dishes cost B300 but the bill came out at about B3,000 to B4,000. 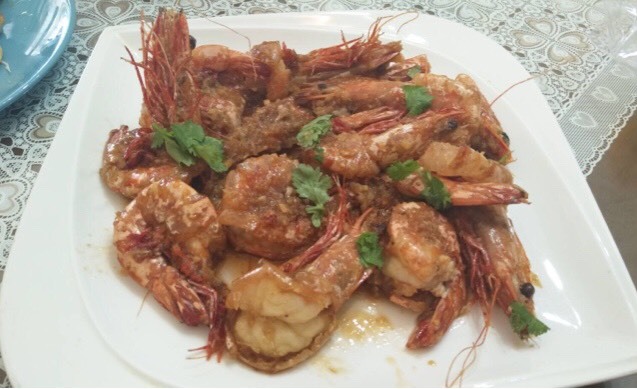 The restaurant told Chinese tourists that B300 is the price for 100 grams of shrimp,” he said. “Since August last year the website has received more than 10 complaints where Chinese tourists have said that ‘6 Restaurant’ cheats for overpriced dishes. One dish cost up to 1,000 yuan. When their customers did not agree to pay, their staff threatened the customers,” Col Tongchai added. 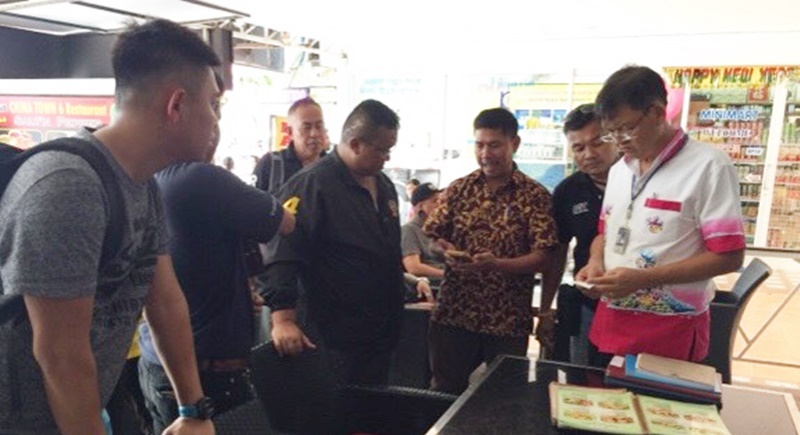 “On Friday (Feb 23), Phuket Tourist Police together with officials from the Phuket Office of Commerce and Phuket Office of Central Bureau of Weights and Measures went to ‘6 Restaurant’ on Thaweewong Rd in Patong. We found that this restaurant sold a dish of 10 fried shrimp with garlic sauce for B2,700 (the menu states the shrimps are B300 per 100g). At that price the weight of the dish should be 900g. However, the actual weight of the dish was 500g,” Col Tongchai explained. “A Thai woman named Kanyanat Chookaew, 26, who is a restaurant manager then showed up at the restaurant and we provided her with the evidence we had and she was taken to Patong Police Station and charged with selling goods by means of deception to cause a buyer to believe in the source of origin, nature, quality or quantity of such goods which is false, where it does not constitute the offence of fraud. “Kanyanat admitted the charge,” Col Tongchai added. “This restaurant also faced legal action with this same charge last year. We warn other restaurants or other services that exploit tourists that they are damaging the country’s image. “This effects the national income which is also generated from tourism. We are serious about taking action against those people who break the law,” Col Tongchai noted. And here I thought ripping off foreigners was the Thai national sport. How serious are you in taking action against these restaurants who brake the law and damage thai reputation, Col Tonchai? Last year RTP action in this restaurant seems not to be serious enough, right? Why is this restaurant still open with all the licenses required? Good work! This example of greed is some of the worst as it continues all over the place, but maybe not to this degree. This is biting the hands that feed them. I know where this restaurant is, and will not ever go there, as this is the second time they've been caught. Obviously the consequences of the first offence were lax enough to not dissuade this dishonest crook from doing it again. \"\"This effects the national income which is also generated from tourism. We are serious about taking action against those people who break the law,” Col Tongchai noted.\"
So why is this restaurant still in business? ?